Spring. A Time of Change. Before we get started with today’s loveliness, I just wanted to remind you of the Spring Fling sale going on right now. You can save 40% on THESE spring designs on orders of $5 or more by using the code: SPRING. If there’s one thing that spring does, it’s change. Adding new growth to decade-old trees. Bulbs buried deep in the ground change and allow new life to come forth through the dirt. Grass turning from a matted brown mop to a luscious green carpet. It’s all about change. And that’s one thing we’ve seen in the scrapbooking world. Change. Styles come and go. We get better at what we do. We evolve. Sometimes I cringe at pages I made over the years. In my QVC days, I remember making 50 pages in one week. Yeah. You heard me. Fifty. There may be one or two in that bunch that I would like to change, but considering I have little time to document what I have currently, I don’t see that happening. But you never know…someday I might. So I can completely understand that desire to want to redo something as Laura is sharing with us here today. Take a look at her wonderfully changed spread. When Kerri asked us to focus on spring projects this month, I knew exactly what I wanted to create. Seeing as how my girls are older, it’s been years and years since we’ve colored eggs or had an Easter egg hunt. 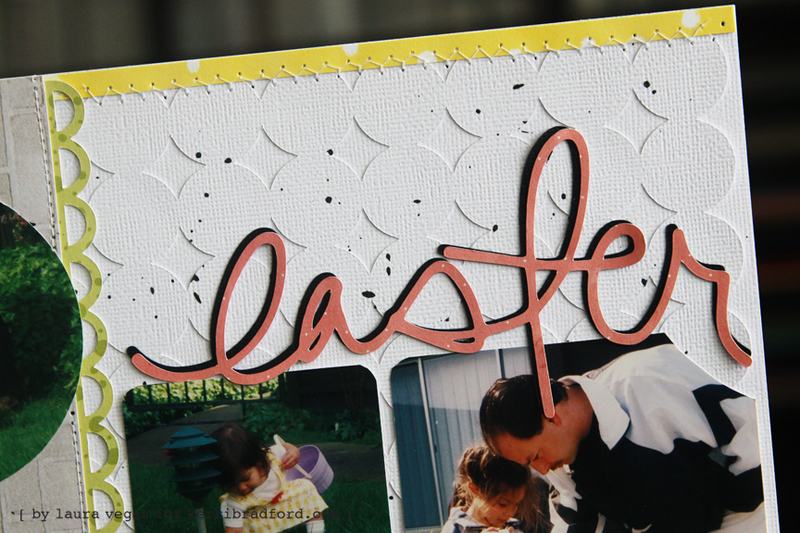 So I haven’t had any Easter photos to scrap in years as well. 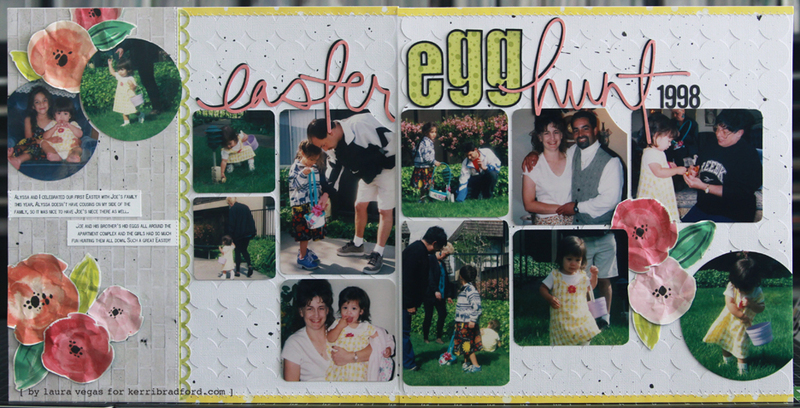 But what I do have is Easter layouts from my earlier days of scrapbooking that I’ve been wanting to re-do. While I have no intention of re-doing all of my earlier layouts, as I know they show the progression of my style, there are plenty of older layouts that really have no meaning or purpose to them. 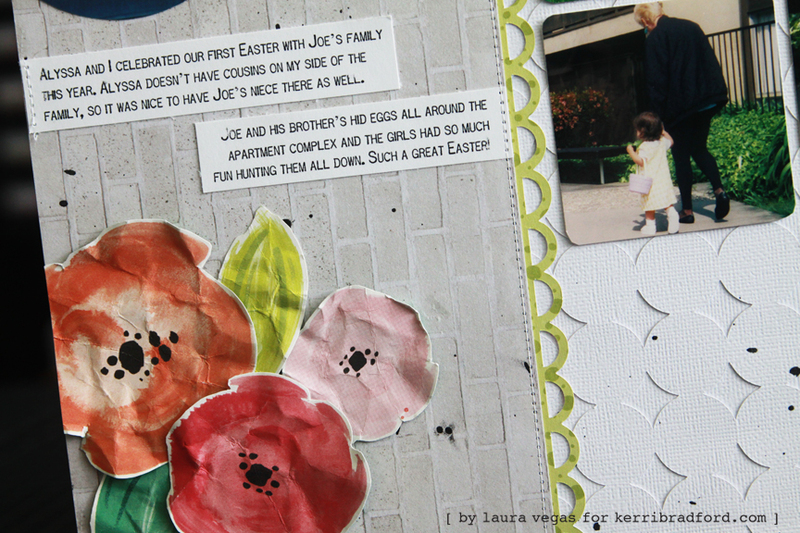 I pulled out an Easter layout from back in 1998, which was actually a three page layout (guess that was a thing back then ;)), and got to work on re-designing it. Since my photos are from back in my film days, I had to work with what I had. Which meant lots of circle photos, some decorative cut corners, cut out corners, etc. I removed all of my photos from the previous pages, and cropped them as best I could, and worked most of them into a collage across the two page spread. I decided to keep a few of the circle photos as is, and work them into the design of the page. I love to use white cardstock for my backgrounds, but I also love to add some texture and interest to them, so they’re not too plain. This is why I’m such a huge fan of using Kerri’s background cut files. It’s no secret that the circle backgrounds are my favorite, and I love to die cut them from white cardstock, to create my white-on-white backgrounds for my layouts. For my title, I used a few handwritten words from Kerri’s Bloom kit, along with the alphas from the Weathered Door [all] kit. I die cut each handwritten word from patterned paper, as well as black cardstock, to layer together and give some dimension. Once again, this change involves morphing old into new. Just like spring. I think it’s a wonderful idea. Perhaps it would be a fun challenge even.